Look on any sewing website or in any sewing book and you will find a list of essential equipment. 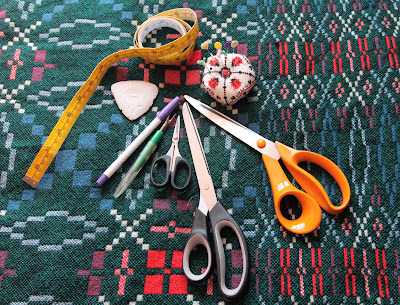 Here, I'm going to talk about my essentials for dressmaking. Quilters and crafters might have a slightly different list, but as a dressmaker that only rarely dabbles in other types of needlecraft I am concentrating here on dressmaking. Large Paper Scissors: You will need these for cutting pattern pieces. I'm not totally averse to cutting tissue pattern pieces with my dressmaking shears,but I would never cut paper patterns with those. That's what I use my paper scissors for. Tape Measure: Buy a good quality tape that will not stretch. I like to wear a tape measure around my neck so it's always with me while I work, but I also like to have a couple of coiled tape dispenser gadgets too. Following a tip from my good friend and seamstress Mary, I always try to carry a tape in my handbag. I treated myself to this one just recently. 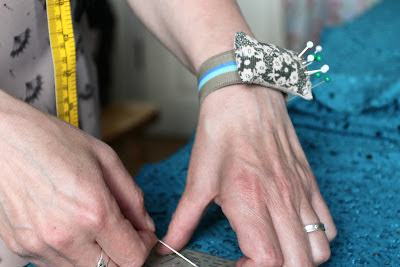 Pins and Pin Cushion: I am probably quite unusual in dressmaking circles because I don't tend to use dressmaking pins. I always used to, but when I started making cloth nappies a decade or so ago, it became apparent that using small pins it was too easy to overlook a pin and leave it in the nappy. Counting them in and out was fine, but not foolproof. That is when I switched to using quilters large pins with large heads. Nowadays I simply find these easier to handle and easier to keep track off...my family do not appreciate stepping on tiny pins I've dropped, they don't like stepping on large ones either, but I'm far for likely to see those before anyone steps on one. Plus, being larger they tend to rarely land in a way that can cause too much damage to a bare foot. Another bonus is that they are very pretty. Top Tip: a magnet is a handy tool to keep with your pins, if you do drop them, the magnet makes it a whole lot easier to pick them up again...just keep it away from your sewing machine if it's a modern computerised model. As for pin cushions, I have several. I like one on my desk and I like to wear a wrist cushion for when I'm cutting out or fitting. Hand Sewing Needles: Hand sewing is an essential part of any dressmaking. I love handsewing, I find it relaxing. I always keep a good selection of hand sewing needles in my pin cushion. Machine Sewing Needles: I always keep a good selection of machine needles and change them frequently depending on the fabrics I'm using, and at the beginning of each new project. This is one of the biggest mistakes beginners make; not changing the needle in their machine frequently or appropriately. Stitch Ripper: It would be nice to never need one of these, but trust me, we all do sometimes, and they are also very useful for cutting buttonholes after machine stitching. Tailors Chalk/Marker Pens: I use both of these. I think my personal preference is for marker pens, usually if I'm drafting a new pattern, rarely if I'm working on a precious item. I wouldn't say I use either that often, but they are very useful. Just don't use the dissapearing ink kind of pen and take a break of a few days before getting back to your project...ask me how I know!!! Iron and Ironing board: You know, really this should be top of the list. I can't emphasise enough how important good pressing equipment is to good dressmaking. I was taught to press at *every* stage of dressmaking. I never skimp on pressing.Your garments will go together so much easier if you press at every stage, and the end result will be worth it. I recently read this excellent article on pressing. Buy the best iron you can, one with good steam, but also good dry iron capabilities. Don't skimp on the ironing board either. I find I prefer a large ironing board, they make ironing large lengths of fabric so much easier, but also feel more sturdy. So tell me, how does this list differ to yours? What would you add and why? My list would be exactly the same (although I do use dressmaking pins) I would say to remember that pins and needles do go blunt over time so do need replacing! The only thing I would add would be my extendable magnetic pick up tool (about £1 from Tesco's) as it invaluable for sweeping round picking up dropped pins! Oooh I like the sound of the magnetic pick up tool, will have to look out for one of those. I'm a quilter/crafter and everything here is on my must have list, especially a good seam ripper. :) Quilting without my rotary cutter, mat and rulers would be much harder, so I would include those in a quilting supply list. 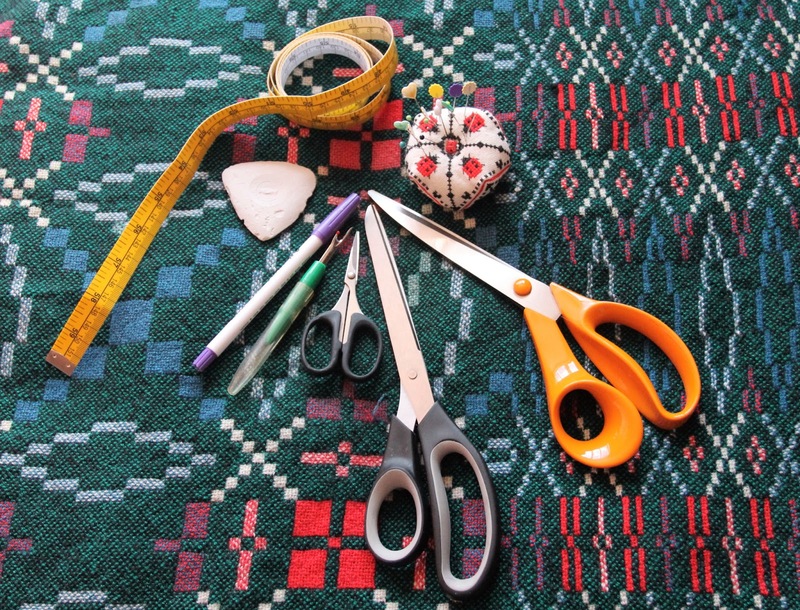 Abi, yes a rotary cutter, mat and rulers are essential for quilters. I'm glad you mentioned those. I think sometimes beginner dressmakers get confused and think they need them for dressmaking too which of course they don't. Printing ink under my fingernails.